Home»I am only what I am. I hope it's enough. I am only what I am. I hope it's enough. 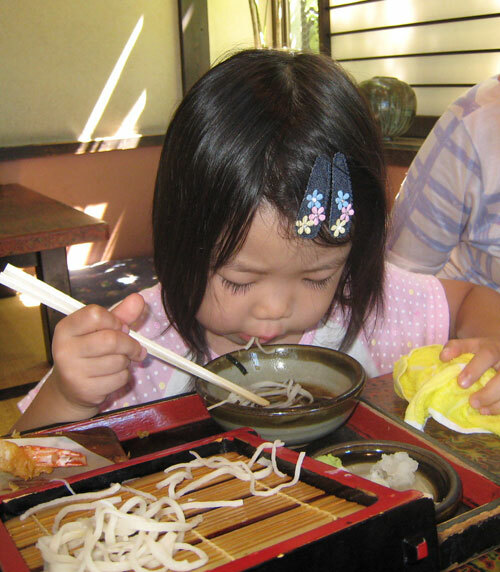 My niece Rena at age 6, enjoying teuchi udon (handmade udon noodles). I am occasionally asked via email or Twitter or even in person, to post a recipe that is Asian but not Japanese. In most cases, I have to say that I have no idea how to make it. Well that wouldn't be exactly true: I could look it up online or in cookbooks and replicate a recipe here. But then, so could you. So could anyone. Just because I am of Asian descent, does not mean I know anything about most Asian cuisines other than Japanese, and the Asian cuisines that have established themselves in Japanese culinary culture. For instance, certain types of Chinese cooking have been made popular by the resident Chinese communities in Japan (the city where my mother lives, Yokohama, has a vibrant Chinatown for instance, as does Kobe). Because of the long and complicated history between Korea and Japan, not to mention attempts in recent years for the two countries to establish a closer cultural relationship, Korean cuisine is also well known and loved in Japan. So, I can tell you how to cook some dishes from those cuisines. I've never been to any country in Asia other than Japan - a situation I hope to be able to rectify eventually. But the point is, my familiarity with most other Asian cuisines is far less than my familiarity with some European or North American cuisines. I grew up in Japan, England and the U.S., and have lived for most of my adult life either in the U.S. or Europe. I know more about Marmite or how to make a home-style Swiss fondue, than pad thai or pho. I love those dishes, but I don't feel confident writing down how to make 'authentic' versions. I do of course like to experiment and try out new things as much as anyone. I'm fine with posting deviations of classic recipes, or something that is 'of the style of'. But when it comes to writing down the directions for real classic dishes, I tend to stick to what I know, the dishes that I grew up with, or the ones transmitted to me by better, wiser cooks than I. So, that's why you don't see much not-Japanese, general Asian cooking here. You'll see some results of experiments in that area - Maki's versions as it were. On the other hand, I have all the weight of the experience of the women (and some men) of my family behind the classic Japanese dishes I post here. They are hovering over what I write, for real (my mother and one of my aunts check out my site all the time and give me feedback, especially if I get something wrong) as well as in spirit. Submitted by maki on 2009-10-14 20:19. Re: I am only what I am. I hope it's enough. I'm sorry for the long reply. This article almost reads like an example of people thinking one Asian country and its people equal another and that just gets me fired up!! In closing, keep up the amazing work! It's plenty! We all love who you are and all the wonderful things you tell us about! Great post. I honestly hate it when people over generalize Asian races and their cultures. I have to constantly remind people in my family that something that is Chinese is not necessarily Japanese. I also hate the ridiculous claims that ignorant people make about Japanese cuisine. To my family Japanese = Chinese = Korean = Vietnamese. It is fairly aggravating as I am sure it can be for you too only a hundred fold I imagine. Can I just say that I love that your mother and your aunt read your blog and give you feedback? I love seeing when one's familial heritage is passed down through recipes-- it's what my aim has been, although it hasn't been reflected in my food blog yet. (I've been better about setting down my mom's sayings.) I believe you capture the washoku "spirit" well when you write about Japanese cuisine, and I'm sure that you do your mom proud. I think you are wise to stay focused and on topic - that's what makes a great blog. Otherwise, it would be like those "Asian" restaurants that feature a menu with Japanese, Chinese, Thai food (etc) and do none of it well. Keep doing what you do so well! Hope you feel better having got that off your chest! I lived (and ate!) in Japan for 20 years, took cooking classes for 4 years in Kyoto in the 70s, my shelves groan with Japanese cooking books and magazines, I can do a search on Cookpad anytime, but it is your authentic voice and your ex-pat viewpoint which draw me here. Always delighted when the feed indicates a new post. Hope you'll simply now just send the url for this post off to the people who don't 'get it'. One of my pet peeves here in New Zealand is the expression "the Japanese" as in 'The Japanese took over that forestry company'. Yeah right, all 127 million of them are now operating the company. I really enjoy your blog, its viewpoint, and that you openly share your hard-earned expertise, whether it's Japanese, Western-Japanese, or Swiss. To read something that is so well focused, with such a clear voice and body of knowledge, is a joy. Unfortunately, most people don't know that 'Asia' isn't a country, or that authenticity is often an amorphous and ambiguous term -- thank you for making this blog so wonderful. Charlie said: "I think I speak for the Just Hungry/Bento communities in saying that we wouldn't want it any other way!" That's certainly true for me! Whilst others can 'play' at Japanese cuisine and fuse it with the food of other countries (and goodness knows there are plenty of books and web pages and even restaurants out there with all kinds of odd Japonica-inspired recipes) there are those of us who desperately want an insight into the actual food that Japanese people themselves feel connected to. your niece is adorable, and looking at those bowls makes me miss livlng where I have access to a pottery studio, gods I miss pottery! Don't see how anyone can expect you to know about every type of cooking, what you DO know amazes me and I'm tickled you go to the trouble of sharing it here with all of us. I have to laugh at this entry. I'm an American of European descent, but i cook Japanese food almost exclusively. I lived in Japan for 4 or 5 critical years as a child (long ago! ), and it now seems that my most basic tastes are Japanese. When people learn what I cook, though, they're always asking me if I make "sweet and sour pork" or "pork fried rice" or some other Chinese-American dish they know. I usually laugh and tell them that Japan and China are much more different than Haiti and the United States. They're neighbors and they share a lot of culture, but language, food, politics, and more are quite different. I come to Just Hungry for a reason. I'm not exactly a Japanese ex-pat, but I'm far away from those childhood comfort foods, and I'm making my way the best I can. I don't even have a Japanese relative anyplace that I can ask for food advice. I have books, the internet, and you. It is more than enough. Thank you for being you. Please don't change, and please be proud of who you are and what you do (and do so well!). The internet gives us access to great websites like yours, where we can learn all about a subject, but the internet also shows the ignorance of a lot of people. Don't let this get to you, and know that you and both of your sites are loved by a lot of people, who know (or maybe have learned) the difference between asian and japanese. I really enjoy your blogs Maki, and I'm so sorry that people keep trying to push their ignorance on you. Coming here and going through the recipes you post remind me of the summer that I spent in Iida, Nagano which were quite possibly the best three months of my life. I also love that I can feel the history that you carry within you and how you generously share it with all of us. You are certainly more than enough! Man, reading this reminds me of all of the times that I've had to explain to someone that I went to Japan, not China and that "no, they aren't the same." My mother who originally held many many prejudices against most people of Asian descent, but now is just as enthralled by the various cultures as I am, and my uncle who was stationed in Okinawa and spent some time in Korea are the only ones with whom I haven't had to have that conversation. Anyway, don't let them get you down. Your personal connection to the recipes you post is more than enough for those of us who come here for exactly what you offer. I've loved your posts for years, and the reason is - completely in line what others have already expressed - that you stick to what you know and love. I've learned so much from your posts. I'm not much into cooking authorities who've been to a country for a week, and then profess authority and authenticity (often misspelling names of local dishes to boot). The other thing I love about your posts is that you, too are an expat - it's interesting to experience places and cultures very familiar to me (Europe, the US) via your eyes. In my opinion, you fuse influences in a way I like - trying to carry on your traditions in a new environment, but also being open to many new things. It's funny how living in a new environment brings out some of the traditions. I'm Finnish, and have loafed around quite a bit. I never bothered to make traditional sourdough starter rye bread that has been in my DNA for generations and generations before moving to Brazil. I find it strange that even nowadays, with world travel and mass media opening up the globe and making it smaller than it has ever been, many people in the West seem to make generalisations about all various Asian cuisines, and tend to lump them all together. I suppose in the UK, because of our colonial history we tend to identify foods from the Asian subcontinent very easily (although an Indian meal in London can get pretty far removed from anything a Indian-born person would identify as curry!) but are less informed about anything from further east. I think things are improving, but sometimes 'pan-asian' restaurants can help confuse the issue - I have been to some which are great, but others...Wagamama, anyone? A prime example of this innocent ignorance/cultural laziness was just the other night on Masterchef, when Michel Roux Jr described a soy, vinegar and lime salad dressing with the vague, non-specific term 'asian'. What part of Asia, Michel? If someone were to describe a cheese as 'European', it could be anything from Cheddar to Brie to Roquefort - not very specific! He probably knows better, to be fair, and to cater for the TV audience this kind of simplification was justified - which just shows how deep-seated this lumping-together of Asian cuisines is. I must thank you as ever for your sites Maki, and I think that you have done sterling work in bringing together tip-top recipes from all areas of your personal experience - be it Swiss, English, Japanese or anything else! We would never want you to be anything other than you! First off, as another "Rena," I must say your niece looks so cute eating those noodles (and your mom looks like she was having fun, too)! But, I completely understand your feelings -- as a person of biracial descent (Filipino and Mexican), I'm made to feel like I'm supposed to be an ambassador of Asian/Pacific Islander and/or Hispanic culture. The problem is, there's nothing homogeneous about the culture of an entire continent! Heck, in both the Philippines and Mexico, there's such a huge diversity of cuisine that I can't speak to what people in other parts of the country eat. All I know is what my grandparents have cooked and served all these years...Hopefully, your post will help dispel the (hopefully unintentional) ignorance on the part of recipe requesters. As always, thanks SO much for exposing me to traditional Japanese cuisine (as well as various other European/U.S. dishes) -- it's expanded my cooking repertoire immensely! You're awesome. I'm a very non-Asian Canadian, but trying to cook exclusively Japanese food for the month of October so I can learn more about it, and your blog has been a major source of information and guidance. Among others, I LOVED your post on "Your guide to better chopstick etiquette"! Anyway, I can vouch for the fact that even from the outside Japanese food is very different from Chinese and other Asian cultures'. I also appreciate your understanding of and sympathy with vegan cooking. Keep up the brilliant work! Couple of years ago I was in Australia for my honeymoon and a family friend of ours offered to take us out for dinner. Because she was worried that we were homesick and missing our own type of food, she said that we were going to have Asian food. I kept thinking that we were going to have Chinese food because she obviously knew that we are Chinese. However, we ended up in this place that had a mixed of Thai, India, Vietnamese and Chinese (that was remotely authentic in my opinion). I had a good laugh after that dinner becaue my husband who spent 7 to 8 years of his life studying in Australia explained to me that in Australia and possibly in most non-Asian countries, it is common for the locals to just lump all the Asian cultures and cuisines together as one. I have to admit that in my part of the world, we would have clustered all those who are non-Asians as Westerners (and hence we refer to their cuisine very loosely as Western food). I won't be surprised that alot of people will protest upon reading this. So I have to say that we are all guilty of failing to make the effort to distinguish between the different cultures and cuisines. Asians and non-Asians alike. Keep up the good work Maki, for staying true to what you believe in. I am still an avid fan of yours because of the authentic Japanese recipes that you keep whipping up! I appreciate this blog so much. I am a foreigner living in Japan trying to take care of my family. You've helped me a lot in learning how to cook Japanese food. 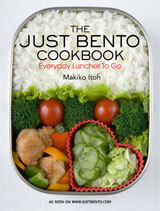 Your bento ideas have been a life saver as my children go through the Japanese school system. I also appreciate your showing some vegetarian dishes as I am vegetarian, but my family is not. By the way your niece and mother are adorable! Thanks to your family for their support of this site. Of course it's enough. People expect too much out of you to the point where they're asking of what isn't even part of who you are. (Did I word it strangely?) As you said, you are who you are. And that is enough. You do this in your free time because you love food and want to share that which you do know and part of who you are. I love your anecdotes and recipes and this site shouldn't be changed to include every other asian cultures' recipes because then this wouldn't be your site anymore. And although there are many who ask all those things of you, do know that there is a very large crowd of us who appreciate who you are (including what you do) and that it is enough for us. And thank you. Thank you Maki for bringing many of the tastes of Japan to my uncultured mouth. Speaking as an average American, I think people mix up the cultures to some extent because they don't know Japan. I never had a chance to eat at a real Japanese restaurant until way late in life. So people go with what they know: the cookie cutter Chinese restaurants and such. They are ignorant of Japanese food. That said, they should look around the site a bit, get a feel about what the site is about, THEN ask stupid questions! Why the ignorance? Japanese cooking is so, er, foreign to many. Different ingredients, techniques, the care in presentation, the different utensils, etc. Your site has been informative for me on many of the little secrets of true Japanese cooking. I started reading your site in an effort to impress a woman, now my wife, through attempts to cook for her and make her feel at home. I'm not there yet, but I WILL be an old Japanese man someday, kicking out favorite family recipes for us. You and your blogs are fantastic Maki, I have learnt way more about Japanese food from you than I did when I actually lived in Japan. One of my many regrets is that I didn't find a friend or neighbour and ask them to teach me how to make all those fabulous foods I loved. Thanks to you, my kids ask for bento every day and would live on rice, fish and tofu if I let them. Because of your blog, I finally know how to make onigiri :) Even my boyfriend who lived in Japan said it's better than store-bought, so thank you !!!! That said, please continue to enlighten me about Japanese food. Love your blog. I just wanted to say that reading your blog is a delight. I'm glad that your posts freely follow your interests, and you also share your photos and thoughts about your family. (The photos of your niece and mom are great). Please continue to follow your muse, we're all lucky that you are generous enough to share. I'have been an avid reader of your posts for over two years and this because this is exactly the blog I had been searching for. And I mean EXACTLY! There is enough information about sushi- or kaiseki cuisine to find on the internet. But for me, I have found japanese home cuisine to be the one that has taught me most about japanese culture. Not that Kaiseki wasn't but honestly I don't feel that a non-japanese greenhorn like me can start neither cooking japanese nor understanding japanese food culture by trying to follow kaiseki recipes (maybe even doing so would be a proof of my incomprehension ;) ). I really appreciate your widely travelled and open-minded way of describing the food you have learnt from your family and your country so that everyone can understand. This obviously only works with food you feel confident about! I am glad my passion is treated so densely on your blog and not watered-down by any superficial arbitrary recipes just to suit all readers. Dear Maki, thank you for being unique!!! When we moved to China last year, my Japanese-American husband was homesick for all his favorite foods that his mother made for us when we lived in California. He searched the web for recipes and came across your site. What a godsend! I can't tell you how wonderful it's been to have a voice explaining so clearly, in perfect English, how to make so many Japanese "mother's cooking" dishes. It was exactly what we needed. That same voice has given me many insights into Japanese culture and thinking. As an expat living in China, I wish I had someone to explain the local culture as clearly! And yes, unfortunately the tendency to stereotype is a human one not limited to any one area. Here people talk of "the West," presumably Europe from Norway to Greece, the USA, and Canada, as one entity. I think they include Australia as well. Anyway, let me add my thanks to the many you've already received. You've made our stay in China so much more enjoyable. Please change nothing. I love your site the way it is. I am living in Japan now, and all those recipe books in Japanese are too hard to read. Your site is the place I can rely on when attempting to cook Japanese foods. It's great to see how you wrote about seasonal foods from time to time. There are so many types of mushroom in the market right now and I'm at lost what to cook next! Keep it up, Maki-san! Yet another "hurrah!" and "Don't change!" As someone who grew up with a restricted diet due to diabetic parents, the only food as an adult I can stand in large quantities is Japanese food! While I am very spoiled by two major Japanese grocery chains in my state, it's nice to not have to wait when I want real karaage or soboro-don for store hours. You are my saving grace when my pocket book says no no! Right on. I think it is telling and troubling that folks ask you for recipes from other Asian cuisines. Do these people contact Italians running Italian food blogs about French cuisines? Doubtful. Your response to this phenomenon is both polite and succinct; more so than I would have been able to write. Otherwise I agree with everybody else, there is no better blog, I know of, if one wants a good read and lots of info about Japanese cooking.